WordPress is a fantastic CMS (content management system) that evolved beyond blogging publishing software script to website builder and e-commerce web stores. Today we are going to learn about how to choose your best WordPress hosting services or provider. Am I a technical person or not? If I am professional IT person, can I manage Virtual Dedicated Servers or Cloud servers without CPanel? Do I need Emails and other bells and whistles with my WordPress instance? Am I a quick technology learner or just blogger? Can I afford a developer for my WordPress website, if I do not want to maintain it myself? Do my budget and time allow me to choose cloud servers or virtual private servers and run WordPress on them? Do I know the estimate or approximate bandwidth and space needed for my website? Do I know, which kind of hosting platform or web server suits my needs? How easy is it to move a WordPress installation from one host to another host? Do I know how to handle security and performance optimization of WordPress blog or website? Do I need a WordPress multisite or single WordPress instance? How far can shared hosting handle WordPress better than VPS or cloud? Differences between shared, VPS and Dedicated servers when it comes to WordPress website? What kind of WordPress web hosting suits my needs? Like this, so many thoughts and questions come to the user’s mind. Most of them will be able to research answers or post a question on Quora and follow what people say. We will break it down, today and make it super simple for everyone to help to choose a WordPress hosting plan that is perfect in most cases. Whether it is web hosting or any other web service, the technical knowledge, interest, time and resources involved makes or breaks when choosing a final product. There are two kinds of users, the first people are technical and second category people are non-technical users. For technical users, they focus on the web server configuration, capacity to handle traffic, plugins and other WordPress stuff. These users do a lot of research and until they find out something that suits as per their requirements they keep on researching. Technical users need not be guided, they know what works for them, but even technical users must be aware because, if some provider says or show something on their website it does not mean they offer the same product. So it’s always better to try out. If you fall in non-technical user category, you look at the price, discounts, support and other things like more storage, bandwidth etc., because you do not know what is more important features and technical aspects that one should look in a WordPress hosting. Here, starts the problem, in most cases, non-technical users are who will keep changing hosting providers until they find something good. This happens because of lack of awareness among users. The problem is every blogger and WordPress niche blog out there suggests hosting providers or hosting plans based on their own experience or without evaluating the hosts. Its true, most of them recommend hosting companies, based on who pays them highest affiliate commission or fee. So, when non-technical users choose such hosts, they get bad hosting or hosting that is not worth using. Now, due to this decision, they will keep moving their website here and there and its time and money wasted. Now, most shared hosting providers do not provide latest PHP version, they still offer PHP 5.2 or 5.4. Latest PHP 7 is recommended to make sure that core WordPress version is fully compatible. MySQL almost comes to the end of life, and MariaDB is better regarding performance and compatible with WordPress. HTTPS support is available with the help of SSL certificates, it means, you need to install a secure socket layer certificate on your web server to meet this last requirement. These are formal requirements for WordPress core, apart from these depending on your theme, plugins, traffic and other parameters the type of hosting is chosen. Most people will ask what kind of web server is best for WP instance. To clear your doubt, we will now discuss most commonly used web servers on the internet. Apache: This is oldest web server developed by apache foundation. An open source community of developers and users, most of the websites, still run on apache due to wide community and users. Apache is ported toLinux, Windows, and Mac or OSX. Apache web server for WordPress is usually stacked with MySQL and PHP. It is known as LAMP (Linux Apache, MySQL, PHP). This is a standard stack, most web developer and system administrators from old school are familiar and experts in it. While LAMP offers great flexibility, robustness, and stability. It is not the best HTTP server when it comes to WordPress. We will discuss why and how in next sections. IIS: This is called Internet Information Services. This is the default web server on windows os or windows server. No one will recommend you to use windows hosting for hosting your WP instance, due to a lot of technical, performance and security issues. IIS is not the recommended web server for hosting WP. You can verify in official WP requirements link above. Most users who bought hosting from companies like Godaddy, for say 5 years, 10 years, 4 years when WordPress is not much popular use it. You will run into too many issues every day when you are on windows IIS server and serve wp on it. Litespeed: This is a commercial web server that offers better performance, security, scalability, robust and compatible with CPanel. CPanel is most popular and familiar hosting management GUI in the world. With IIS and Nginx, you cannot run CPanel, as both of them does not support it. So Litespeed is the best possible option for someone who wants the GUI awesomeness of CPanel and hosting WP on it. Nginx: This has both a commercial version and free version as well. This is not a full-fledged web server like Apache, which is easy to configure and work with. Another issue or disadvantage is Nginx cannot be clubbed with CPanel. As CPanel software officially supports either apache or Litespeed. So, if you are someone who is not technical and not comfortable to work with commands, then stay away from Nginx based hosting. Although it will perform better in some cases when compared with Litespeed. Still configuring PHP, Apache rewrites rules and other commonly used configuration is difficult with Nginx. Also, it should be noted that free or community version has less high availability and other rich features missing. There is a software called Engintron to attach CPanel with Nginx and build a high-performance web server, but unfortunately, it is still in early stages and we do not see any host actively pursuing such projects. After the above discussion, you can come to some better conclusion now. When choosing WordPress hosting web server offered by hosting provider makes a huge difference in performance, security, and robustness of the wp site. For those who wants to use CPanel based web hosting, it is clearly identified that LiteSpeed based hosting is the best. For those who does not need CPanel or any control panel GUI for them custom Nginx stack like LEMP (Linux Nginx, MySQL, and PHP or Linux, MariaDB and PHP) will work better. All these hosting types can handle WordPress better when the following underlying software stack is used. Almost 95% web hosting companies out there, including those suggested by WordPress hosting page itself, does not use the performance stack. Let’s see suggested hosting providers. Bluehost: Shared hosting, VPS and dedicated hosting all of them uses, Apache Web Server, MySQL, and CentOS. They do not use MariaDB which is a performance booster, Litespeed which offers the best performance and CloudLinux OS which offers reliability, security and account isolation. Due to old software and hardware stack, the WordPress instances usually does not perform well out of the box. Although they have WordPress optimized hosting which is very costly and custom made for WordPress websites and blogs. Common users cannot afford to spend on such stack. Next time when someone suggests you Bluehost or Hostgator or just host or some other provider with Apache, MySQL and CentOS simply do not listen to them. They are just telling you to sell poor hosting and earn their commission. Dreamhost: They have their own Control panel custom made by them. It’s not clear from their website what kind of web server they are offering and what kind of servers their customer’s websites are powered by. So, it’s a NO for the customers who are interested in Industry standard CPanel based web hosting. If you choose CPanel, even if your host does not offer proper customer support, you can google it and find the solution. It’s not the case with custom control panel, you have to depend on your host to solve your issues if any you face. Flywheel: This is a WordPress only web hosting, it does not have industry standard CPanel. Which allows you as a customer to enjoy emails, host other websites built using basic web development stack like PHP, CSS, JS and HTML. It is made and tuned just foWordPressss, so obviously it will perform well. It’s good for someone who is happy with the pricing, WordPress only hosting without many features. Mostly preferred by developers, designers, and agencies that manage customers websites. Siteground: This hosting uses Apache and Nginx, Nginx is used as frontend cache or load balancer and apache for making it compatible with regular CPanel. Although Nginx is faster if used directly with PHP-fpm and without CPanel. Putting CPanel in between the Nginx and apache makes it the same as those host using varnish cache to accelerate website. True performance is not achieved in this case, but on the other hand, they have WordPress only hosting which is different from shared hosting. Shared hosting: Cheap, Good Features and Support, Good for starting up your WordPress blog or website, handles up to 5k visitor per day. If you choose the recommended stack hosting provider. VPS hosting: Pricey, Good if you are a technical person or you have a developer who can manage your server. Better for people whose traffic is more than 5k visitors per day. Remember, if you purchase VPS to make sure that you are getting dedicated RAM, CPU and SSD storage along with premium tier bandwidth. Do not purchase VPS just because it is as cheap as shared hosting. Shared hosting works better than VPS if you do not know how to tune your virtual private server and you do not know hardware specifications. CPU cores: 2 (if dedicated). 4 cores, if shared. Network Location: Where your audience is, choose the nearest location possible. Unless your VPS provider have special features like best network latency all over the world. Backup: External R1Soft or JetBackups should be good. The VPS with above configuration will easily cost you around $100 per month, from quality VPS service provider. On top of it, managing VPS is time and money consuming, if you are not a technical person. Instead of this, you can be purchased WordPress hosting, that offers management as well and pricing is affordable as well. Dedicated Hosting: Usually, does not make much difference when compared with a properly optimized VPS and Cloud hosting Virtual dedicated server. Obviously, it’s too much costly and if unmanaged dedicated server. Your management and system admin costs will reach sky high. It is for those people who have millions of visitors per day and obviously, such people have team and money to spend. They will use customized enterprise solutions. It’s clear that shared and VPS services and hosting plans are best for hosting your blog or website when it comes to CPanel interface and pricing. What you need to know is that word press does not consume any bandwidth if it is idle. Idle in the sense, if you have a blog XYZ and no one visits your blog or you never log in to make any changes, then the bandwidth consumption for the whole month will be not more than 100 MB. It means, by purchasing unlimited bandwidth or unlimited transfer hosting, you are simply buying hosting from a provider who is overselling the resources that normal users never need. Another issue is there in no such thing as true unlimited bandwidth, if you carefully see the terms and acceptable use policy. Everything is capped at some points. By purchasing such unknown limits hosting, you are putting yourself into darkness and you never know when your host will suspend your account for violating their AUP. It’s our honest suggestion for everyone reading this article, simply stay away from unlimited or unmetered bandwidth. It’s good to know your limits and you can understand your consumptions, that will help you with scaling up. This is yet another marketing trick, which will be done by hosting providers because users who are not into hosting or technology. Do not want to make things complicated by calculating their needs, so for them buying something unlimited means, they do not need to brainstorm about their website hosting resource needs. And most people think that hosting space needs to be unlimited or expandable because they will become next facebook or twitter. In the real world, average WordPress instance or installation in simple English will be around 500 MB to 2 GB size. If users are beyond this size means, they obviously are using too many pictures or their media files on their hosting space. As the core files and page or posts will never occupy in gigabytes. Now, this unlimited space is oversold. by purchasing such hosting you never know when your host will say that you have crossed your AUP or limits. There is a fair use policy for each user on shared hosting, so keep in mind that unlimited is truly not what it mean in the real world. Performance is another reason where unlimited hosting plans fail, due to overselling the resources and server. Most of the accounts end up slowing down as accounts on server increasing. Another problem is customers think it is unlimited hosting space and upload as much as possible and due to the file count increasing in occupancy the read and write speeds will become worse. If you are on HDD, we cannot tell you, it will be the probably worse case. Avoid unlimited space or storage hosting if you want performance, stability, and most importantly security. It is easy to move your wp from one host to another host if you have ease of access to your files and database. Which is possible when you use an interface or control panel like CPanel. Keep in mind not all shared hosting are crafted equally, not all managed or wordpress hosting services are built on same configuration and specifications. If you are in look out for WordPress only hosting, then try out each provider and see how they are doing when it comes to their stack, support and pricing. Don;t blindly read reviews on the internet and purchase things which you will never use or useful for you. Most review websites and bloggers out there will never come and help you if something goes wrong with your website or hosting. Never depend on their recommendations and have your own choice. 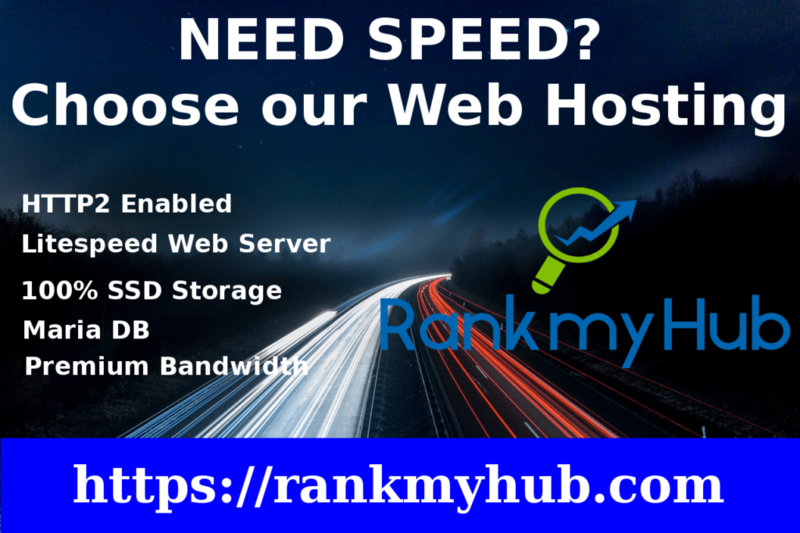 Adding more RAM, buying more CPU cores and VPS / Dedicated servers do not speed up your WordPress. Website loading time depends on too many other parameters so spend your money wisely. Consult a company that deals with WordPress consulting services, who can provide you better architecture for your needs. In case shared hosting is not sufficient for you. Linux web hosting is the best thing if you want to host WordPress. so never think about windows, at least with wp hosting case. CPanel is needed for most users, even for technically strong users, so keep note that all Cpanel are not the same. Most hosts are not offering latest CPanel. They are either customizing it or bloating it with their own products to upsell you, stay away from such companies. If you ask us for a suggestion for shared web hosting for WordPress websites or blogs. We will proudly say that we are one among the best WordPress optimized CPanel hosting companies. CloudLinux OS for keeping your account isolated from bad neighbors. It makes sure that you are getting dedicated resources as per your plans, offers security, reliability, and performance. Daily Backups for free and automatic. PHP 7 and PHP 7.1 is also available. We have multiple PHP version selectors that offer backward compatibility as well. 1 Click SSL certificate installation, Unlimited SSL certificates for free. 24/7 Email and Support ticket based support. Free WordPress speed optimization and regular security scanning. Apart from all these features, you will get latest CPanel, Emails, ability to host multiple websites, pay monthly or yearly and 100% FREE Trail to try before you pay or buy. Cloud Hosting: Most of the bloggers and some technically intermediate users say that cloud hosting services like Digital Ocean, Vultr, and other similar providers are cheap and offer the best value for money. Let me tell you unless you are comfortable with command line, you should never think about hosting on the cloud, at least for some more years. Cloud is penetrated into public very well, but still, there is no definite process or guide to use cloud servers properly. If something happens and you are lost in the world. You have to depend on forums or google to recover your wp instance to get it back to running state. It may be cheap but at the cost of technically zero support. If you are a normal business owner or nontechnical person, interested in cloud, put demo sites or testing site on it and learn it. Never move your production or live website to cloud servers, unless you are 100% sure that you can manage it. Also, you need to know, the pricing overview of various web hosting platforms for that, read our web hosting overview.